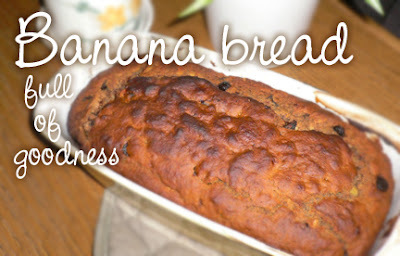 I had 2 bananas getting much too ripe so of course I had to make banana bread! But not just any banana bread -- I wanted to pack this one full of seeds. A soft, muffin-like loaf pictured here made with barley flour, brown rice syrup and almond milk. In a large bowl, mash the bananas and blend with 'milk, oil, vanilla, and brown rice syrup if using. Stir in all the seeds, carob chips and raisins or prunes. In a small bowl combine flour, sugar if using, baking powder, baking soda, salt and spices. Stir into the banana mixture without over-mixing. (If using sugar instead of syrup you might need a little more 'milk.) Pour into a lightly oiled loaf pan and bake at 350F for 45-55 minutes (check if a knife inserted in the center comes out dry). Makes 1 loaf. Inspired by the recipes in La Dolce Vegan. Bananas aren't suitable for Pittas and Kaphas, so try using mashed mango, applesauce or cooked plums instead for a different take on this baked treat! This was fantastic, Fran. I am a lazy baker so I put all of the most ingredients, including the prunes, into my cuisinart. I held down the blend button a few times until it was just mixed. Then I put in all of the dry ingredients, except the flour, chips and nuts. Blend it by pushing the button a few times. Last, the flour, chips and nuts, mixed until just moist. I've found that it can get tough if I overmix the flour. Anyway, turned out awesome! Thanks for the recipe. This is a keeper. Moist & hearty! It has a flavor similar to a spice cake. I'm going to make this one over and over again with whatever type of fruits that I have that need to be used! I'm new to your blog, but love what I'm reading so far!! Great recipes followed up with solid info :) Thanks Fran!